Stainless steel utensils feature a 1 3/8" built-up handle. 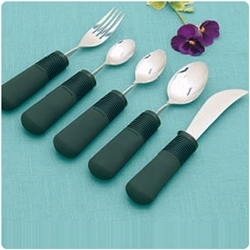 The forks and spoons have special twist built into the metal shaft that allows them to be bent in any angle, for either left- or right-handed use. The Pediatric spoon has a smaller handle and bowl that are ideal for pediatric use. 6.5"L. Institutional dishwasher safe.